Nearly 60 percent of the population – or 190 million Americans – suffer from one or more chronic diseases, and they are creating a major drain on the U.S. healthcare system, according to new research. If current trends continue unabated, the cost of treating people with multiple chronic problems will total more than a staggering $42 trillion between now and 2030. 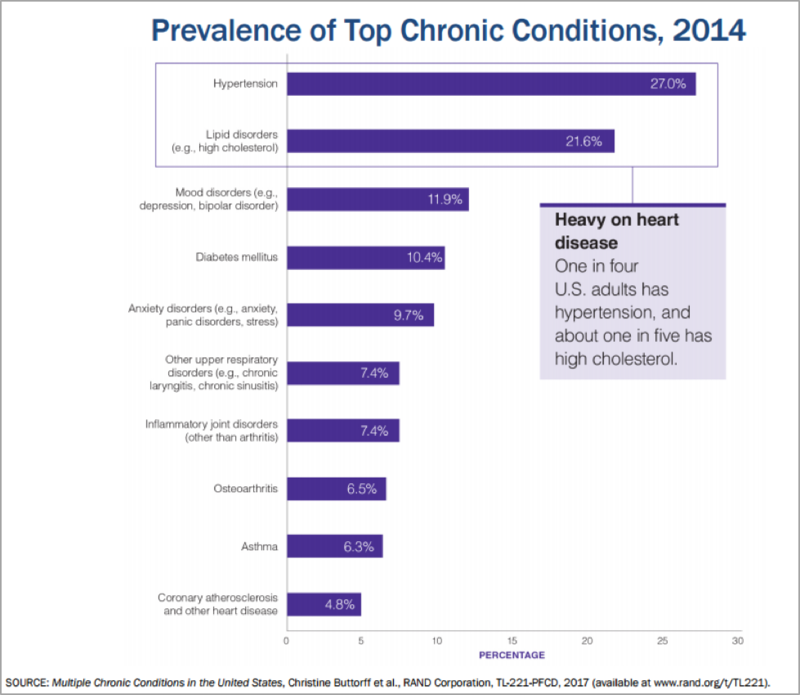 Remarkably, just 12 percent of people with five or more chronic conditions such as diabetes, heart problems and arthritis account for 41 percent of total health care spending, according to a new study by the RAND Corporation for the Partnership to Fight Chronic Disease. As much as $6.3 trillion in health care cost savings could be realized over the next decade and a half if improvements are made in prevention and treatment. One of the biggest sticking points in the debate over the GOP effort to repeal and replace the Affordable Care Act is whether to ease legal restrictions on insurers charging older, sicker Americans and those with preexisting medical conditions higher premiums than the rest of the population. Under the GOP-drafted American Health Care Act that narrowly passed in House earlier this month, states could seek waivers that would allow insurance companies to charge people with pre-existing medical problems a lot more for health insurance premiums than those without persistent medical conditions. For many, that would mean joining government financed “high-risk pools” with premiums and copayments that they could not afford. being driven out of the health insurance market has now shifted to the Senate where Republican lawmakers and their staffs are struggling to come up with a politically palatable alternative to some of the harsher provisions of the House-passed bill. Many major insurers including UnitedHealth Group, Aetna, Humana and Blue Cross-Blue Shield have either abandoned the Obamacare exchanges or sharply curtailed their participation because they were losing money covering the claims of a pool of beneficiaries dominated by chronically ill people with large expenses. A good deal of the debate until now has focused on what can be done to level the beneficiary pool between healthier and sicker people, in order to boost insurers’ profits. But far less has been said about the makeup of the large cohort of Americans with one or more chronic medical conditions and how they likely will impact the future of the health care system. People with multiple chronic ailments generally have poorer health, use far more health services, spend more on their care, and are more likely to develop other chronic conditions as they get older, RAND reports. The data also confirms that multiple chronic conditions are most prevalent among older adults, women, and non-Hispanic whites than the rest of the population. The report said that with the growing surge of baby boomers retiring and making claims on Medicare and other health care services, it is urgent that policymakers begin planning for the care of people with complex chronic conditions. That’s because – in part -- people with multiple chronic conditions have higher hospital readmission rates than healthier Americans. 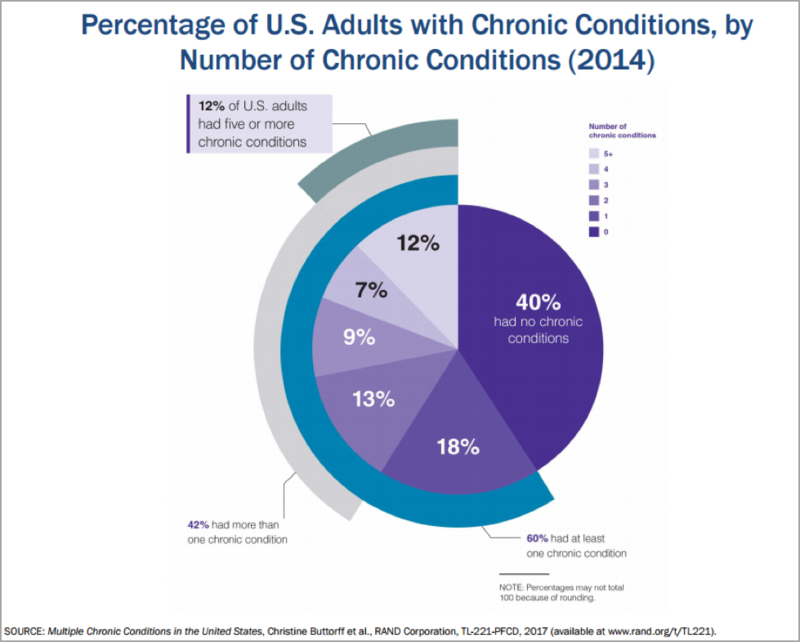 Six in ten adults had at least one chronic condition as of 2014, and 12 percent of adults had five or more chronic conditions. 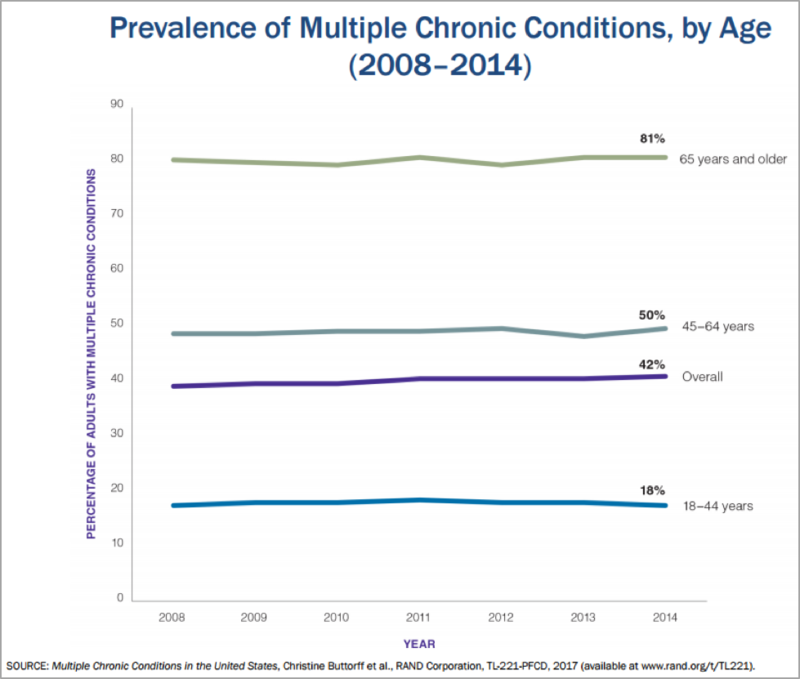 Chronic conditions are far more prevalent among older adults, with 81 percent of those 65 and older suffering from multiple chronic conditions compared to just 18 percent of those 18 to 44 years of age. Women 18 through 64 are more likely to have chronic conditions than men. Of the 100 million people with multiple chronic conditions, 54 million were women as of 2014. The most common chronic conditions are hypertension and high cholesterol. Those are followed by depression, diabetes, anxiety disorders, upper respiratory disorders, arthritis and other inflammatory joint disorders, asthma and heart disease. Health service use and spending are much higher for those with chronic conditions than for healthier adults. That applies to emergency room visits, inpatient hospital stays, drug prescriptions and outpatient visits. Those with five or more chronic conditions spend twice as much on average as those with three or four conditions. On average, adults with five or more conditions spend 14 times more on health care treatment than people with no chronic conditions.